In a symbolic rejection of US capitalism, Bolivia announced it will expel the Coca-Cola Company from the country at the end of the Mayan calendar. This will mark the end of capitalism and usher in a new era of equality, the Bolivian govt says. “December 21 of 2012 will be the end of egoism and division. December 21 should be the end of Coca-Cola,” Bolivian foreign minister David Choquehuanca decreed, with bombast worthy of a viral marketing campaign. La nacionalización garantiza la continuidad laboral y demás derechos de todos los trabajadores de la empresa Transportadora de Electricidad SA, con relación a su antigüedad y demás derechos y beneficios sociales. 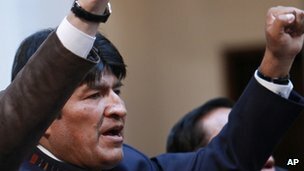 El presidente de Bolivia, Evo Morales, ha nacionalizado las acciones que Red Eléctrica Internacional, filial de Red Eléctrica Española, posee en la empresa Transportadora de Electricidad (TDE), y ha ordenado al comandante en jefe de las Fuerzas Armadas, Tito Gandarillas, que “tome las instalaciones de la administración y la operación” de la empresa. Bolivian President Evo Morales has nationalised a Spanish-owned electric power company. Mr Morales ordered the military to take over the subsidiary of Spanish power company REE, which owns and runs around three-quarters of Bolivia’s power grid. Mr Morales said he had ordered the move in honour of the Bolivian people fighting to regain control of their natural resources. Last month Argentina took control of Spanish-owned oil company YPF. Speaking at a May Day ceremony, President Morales said that “in honour of all Bolivian people who have struggled to recuperate our natural resources and basic services, we are nationalising Transportadora de Electricidad (TDE)”. He said he was expropriating the company because it had failed to invest sufficiently in Bolivia.